Sugar Cubes. 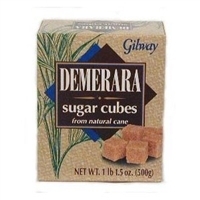 These are the sugar cubes Lana uses when serving tea at Lana's The Little House and are unrefined naturally brown sugar cubes. From natural cane, these golden cane cubes, rich in flavor, are perfect for giving the right amount of natural sweetness to your world class teas. Product of Mauritius. Packed in Belgium. 126 cubes.